In the year of 1413 - the new King of England, Henry V of Lancaster, pursues ambitious plans: the unification of England and the conquest of the French Crown! Each player is the leader of their own aspiring noble family. Who will become a true supporter of the young King and thus the most powerful Lord of their time? Beth Heile of Cat & Mouse Game Store in Chicago, IL, provides an overview of Lancaster, from Queen Games. Great Britain is under attack by the French! You must use your knights and influence to help withstand the enemy. But you don’t really need to help out, the enemy will back out eventually – which is kind of a flaw in the game. I’ll get back to that later. Each player has a castle. The castles gives several actions themselves, but is also the place where you keep your avaliable knights and noblemen. At the start, everyone receives a knight in each level ranging from 1 to 4. 4 is the most powerful and influental knight, but there is only 1 per plays in the game, as is it with a level 3 knight. 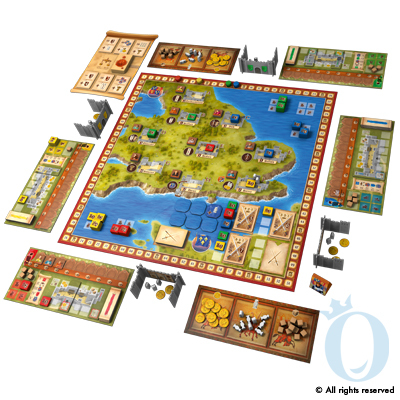 The board has 2 areas: land and sea. The sea represents the invading French army, and it’s possible to place knights there. But the main course is of course the land area. This area consists of many castles. Each castle gives you a boon if you control it at the end of a round. But in order to control it, you use your knights. Some castles requires a level 3 or 4 knight in order to enter at all, but most castles are level 1 and 2. To control a castle, you simply put a knight of your choosing there, as long as it meets the requirement. You may back it up by using disposible squires thus making it stronger. If another player is able to put a stronger knight than what you represent, you are kicked out. But the knight is returned to you, giving you a new action for later. The squires you had used, however, are not returned. So this is a battle of influence. The game round doesn’t end until every player have placed their knights, either on the main board or in your own castle. Those in your own castle can never be kicked out during a round, but the powers from the main board are far better than the castle ones. But eventually, you may not have another choice. Alternatively, you may go and fight off the French. You just place a knight in an avaliable spot in the fight, and if the battle is won, you get victory points. If it’s not won, the battle just goes away after a round or two. But then, all knihgts represented in a losing battle are taken hostage. If you can’t pay their price, they are lost. And knights are expensive to buy the regular way. After each round all players get to vote on some laws. There are always 3 laws present, but some or all may be replaced, but only if the players vote for it. If most vote against it, the new law is just discarded. These laws give immediate victory points or other benefits after the laws have passed or not, and are very important in order to win the game. The game goes for a set number of rounds, and whoever has the most points at the end is the winner. It’s a very nice game with a lot of strategic thinking. But it favors the early player to get more knights, which is a bit of a bummer, since the game is of great quality and fun. Lancaster is definitely one of my favourite games! Where else do you get to vie for the King’s favour, go to war and pass legislation all within the same game? 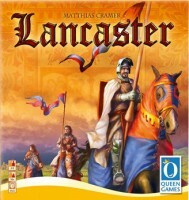 Without describing the rules of the game in too much detail (you can read that elsewhere), Lancaster offers a variety of mechanics as you try to convince local lords to join you for dinner, wage war against the French, renovate your castle, upgrade your knights and vote on legislation all in the name of earning power points that will propel you ahead of your competition. It’s a worker-placement game at heart that offers you a variety of ways to achieve your goals. Will you spend your time gaining influence so that you can pass the laws you want or will you upgrade your castle or increase the rank of your knights? It’s all up to you and the number of ways to tackle the problem of gaining power points is one of the most interesting aspects of the game. While sounding like a lot to take in, the rules are surprisingly straight-forward and I’ve had little problem teaching to them to gamers of different interests who have joined our table. Every game we’ve played has been interesting and the final scoring has always been extremely close. The game components are top-notch and really draw you into the game’s theme. The only problem that I’ve had with the game (and I’m not sure it’s much of a problem) is with Analysis Paralysis on the knight placement phase. People sometimes pull their hair out trying to figure out where to place their pieces and the fact that other players can boot them off of a location with a stronger army make the consideration of adding squires or more powerful knights to the placement even more interesting. I think it’s really best-suited to 3 or 4 players although we’ve had a blast with it with 5. So if you enjoy confrontational worker placement games that include a voting mechanic and an excellent theme, Lancaster is a game I’d highly recommend you check out! Add a Review for "Lancaster"